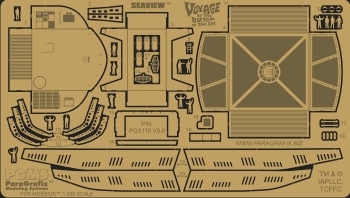 Just in time for the release of Moebius Models'™ "baby" Seaview™, this photoetched set brings the kit to a whole new level of realism. Special Thanks to Steve Causey for providing the builtup kit shown in the images below and kindly giving permission to share his in-progress photographs. We will share many more soon in a buildup gallery — in the meantime, check out more of Steve's work via the link on our "will build for others" page.